Director YEON Sang-ho of King of the Pigs has made a new film. It's a 30-minute short film called The Window, a story set in the military. Despite its short duration, Yeon's depiction of social reality is as sharp as before. The Window is also the first film of the 'Independent Short Film Release Project' organized by Indiespace, an independent-only theater and Indieplug, a digital distributor of independent films. - You must have been busy with King of the Pigs, yet you've completed The Window very soon after. I finished King of the Pigs in March of 2011 and I didn't have much to do after that. I only had to edit it by October in time for the Busan International Film Festival. Editing involves working with one's head with an editor so it's not physically taxing. I applied for production support at the Korea Creative Content Agency (KOCCA) and got some funds so that's why I started working on The Window while completing King of the Pigs. While doing interviews for King of the Pigs, I also worked on The Window. - You've said before that you wrote stories while doing your military service in your soldier's notebook. King of the Pigs was one such story. Was The Window, depicting the conflict between Corporal Jung and Private Hong, also written during that time? I wrote The Window after I left the military. 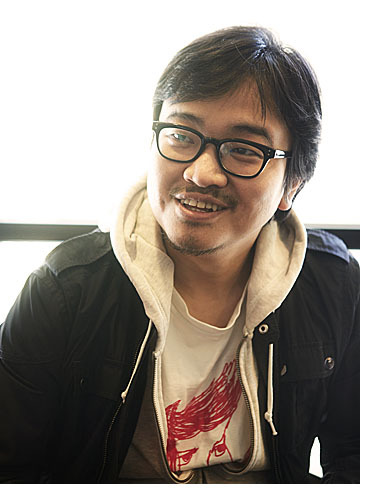 Cartoonist CHOI Gyu-seok was asked by the National Human Rights Commission of Korea to come up with a story idea. They were offering a high fee. I had a couple of items that I'd written that fit with what CHOI was trying to do and one of them was The Window. The commission saw the script and liked it. CHOI drew the cartoon and it became a series. - Why did you make the script into an animation. The Human Rights Commission of Korea had an animation project called If You Were Me: Anima Vision. They've done two animations but I've never had a chance to take part. Every time I applied, I was never accepted. I have a lot of interest in human rights issues so I wanted to do a story concerning them this time round. - It was shocking to find out that most of the story in The Window was from your own experience. JUNG is me during my military service. I went to military prison, too. It's all 100% my own, personal experience, so it's strange to call it a script. I merely put my experiences together and it's based 100% on what actually happened. - There is no definite offender and victim in The Window and the story is structured so that the audience can empathize with all of the characters. When you were writing the script, whose side were you writing from? I tried not to focus on any particular character but I do think my personal views seeped through to the story in general. I thought I was an average soldier but it turned out I wasn't. It's difficult to talk about how to be a good soldier during one's military service. I don't think it's easy to say that the view shown in The Window is the definitive way to serve in the military but I wanted to show that this viewpoint exists. - Your position in the film industry has changed greatly since King of the Pigs. There is already a lot of attention on your next feature animation, The Fake. I took part in the Asian Project Market at this year's Busan International Film Festival and got a lot of interest from local and overseas film professionals, which means I only have to focus on making a good film now. Many people were interested in The Fake as well. Circumstances have changed so much, beyond my wildest imagination since King of the Pigs. - Tell us more about The Fake. It's about religious cults and faith. The film uses criticism of religion as a basis but it's more about what faith actually means for people. Koreans tend to think about social phenomenons, beliefs, ideas about personal social justice and personal values in a religious way. It's a story which shows how this kind of belief can be broken. - In Korea one issue can attract totally opposing views. Your films explore those issues so I believe that you will have plenty of topics to choose from for your future films. I agree with you. If the government changes at the next presidential election, I think more detailed stories may come out. I was praised for King of the Pigs but I think it can have different interpretations. I wasn't meaning to talk about different classes in society but there were many discussions about that. People only mentioned authority, gap of wealth and school violence. We have a very tight framework in this society so room for discussion can be very limited. The Fake is due to be released in the first half of next year so I'm hoping that there will be a wider and more diverse societal framework to accommodate different interpretations of the film.